It had been ages since The Bestie and I enjoyed high tea together (last December in Melbourne if I recall correctly) so we finally made time last month to partake in some afternoon tea action. Although I was tempted to suggest going to Rochelle Adonis again, we chose unexplored territory instead: the Pan Pacific Hotel (formerly the Sheraton). 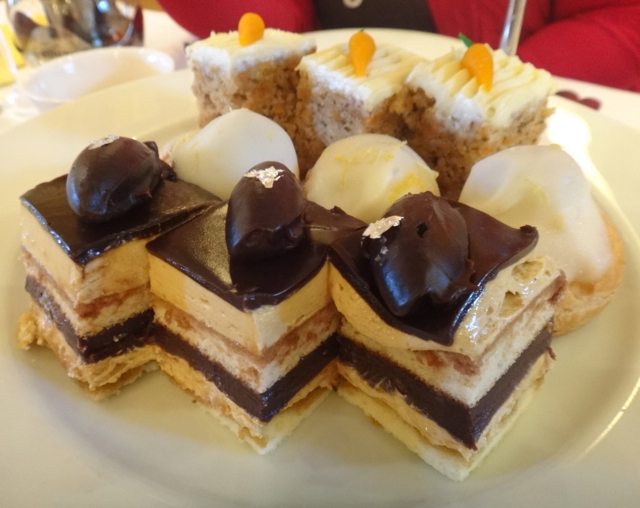 I had heard good things about the high tea at the Pan Pacific so I was fairly confident that we wouldn’t be confronted with the same depressing pastries, petit-fours and finger sandwiches that have become standard fare at some venues. I want, nay demand, things that make you bug-eyed with excitement! At $39 per head, I was certainly counting on the Pan Pacific to deliver just that. High tea is served at the hotel’s Origins Restaurant which has a sophisticated, classic decor that immediately puts you in the mood for hours of taking tea over casual banter. The high ceilings unfortunately do carry noise a bit but with tables set far enough away from each other, it was easy enough to ignore the enthusiastic celebrations of a large party of 20-somethings in the centre of the venue, and a chatty hen’s table nearby. 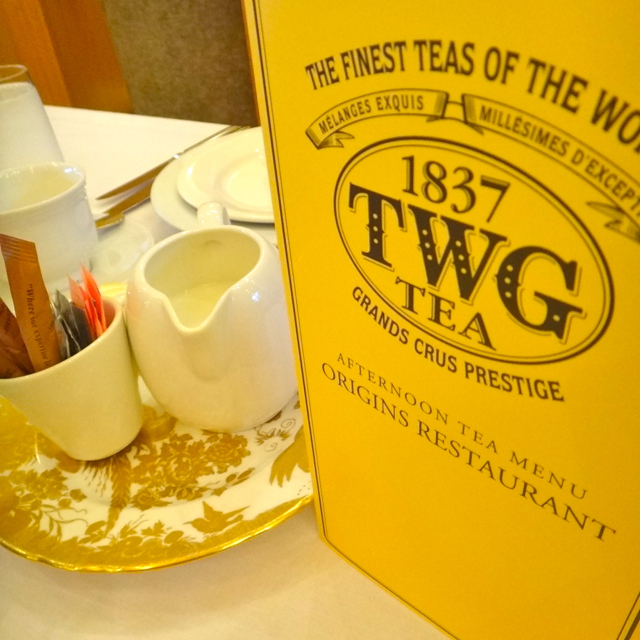 Once seated, we perused the delightful range of teas from the TWG Tea Company menu and made our selections. 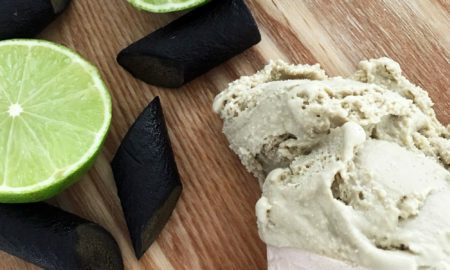 I chose a tropical blend which had a gentle note of coconut without any obvious (and often distracting) after-taste. After a brief moment of catch-up talk (I should add here that The Bestie’s high school girlfriend L made it a table of three), a plate of very appetising entrees appeared which was a pleasant surprise given a lot of high tea establishments like to plonk down the usual three-tiered plates from the get-go. 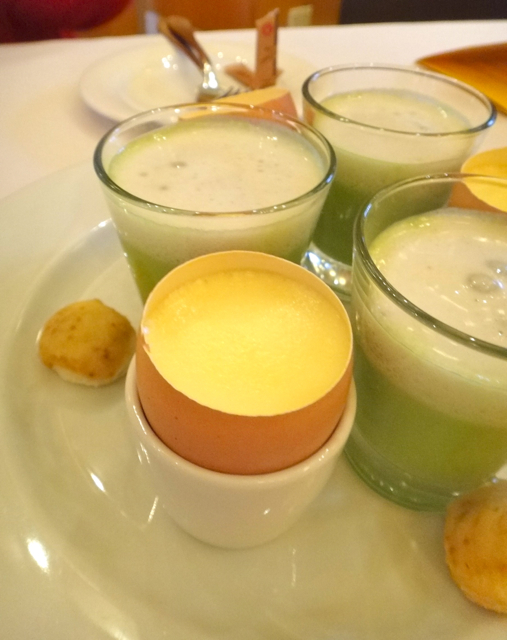 Instead, we were gently introduced to the delights to come with minted pea soup, truffled egg custard and mini brioche. Our entree disappeared almost as soon as it appeared and after a moment to relish the flavours, the remainder of our high tea delights arrived. As I had hoped, I became bug-eyed with excitement. There was so much gorgeous food to take in that I could hardly pay attention to the waiter who diligently described everything set before us. The first tier consisted of Opera cake, carrot cake, and mini lemon meringue tarts, which were all perfect in portion size. 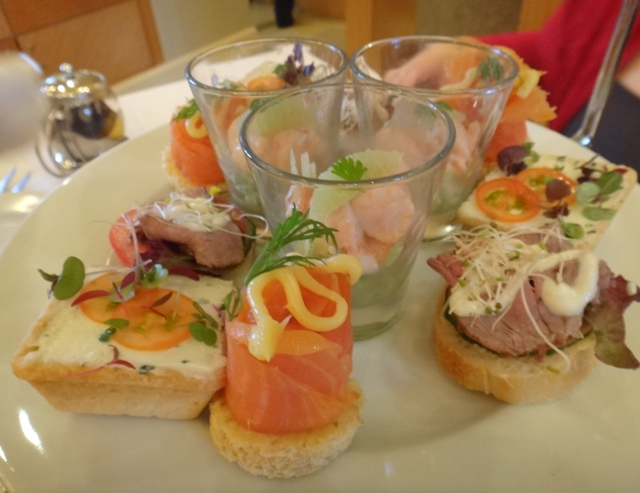 The second tier (though ironically always eaten first by The Bestie and I) was my favourite; laden with smoked salmon and roast beef open sandwiches, mini prawn cocktails and a cream cheese tart. The last tier is almost always the scone tier and the Pan Pacific was no exception to this tendency. Sadly it’s also the tier you end up forcing yourself to eat, given the amount of food consumed preceding it. Unless the scones and/or jam are spectacular, it’s a struggle. The scones unfortunately were not bad (choc chip) but we all agreed that we could’ve taken it or left it (but we took it…). 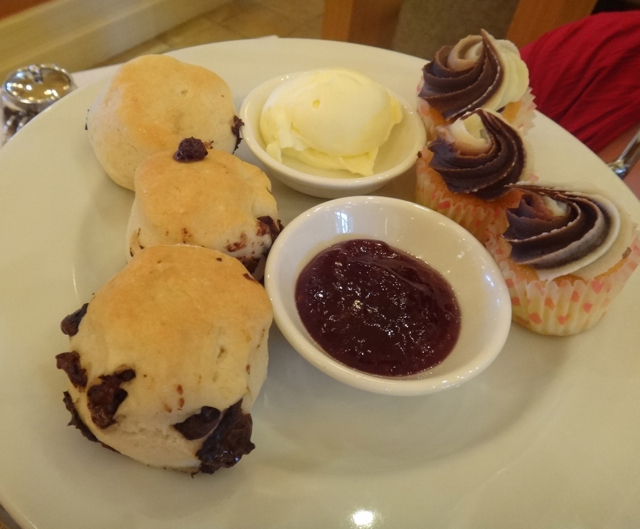 The scones shared the tier with some small chocolate and orange cupcakes which while also nice, were superfluous. If anything, I would have welcomed a more savoury or plain scone given the cake layer sufficiently increased our blood sugar level. Overall however, I loved the Pan Pacific’s high tea and it got all three of us ladies’ seals of approval. It may not have provided the bespoke, intimate treatment of Rochelle Adonis but it was far from bog standard and I was suitably pleased with what was served. The staff was efficient, friendly and perfectly dressed and engaged for the occasion. We remained chatting long after the food was eaten but we were never pressured to leave. If you’re seeking a good high tea experience in Perth, then I can certainly recommend the Pan Pacific Hotel. Wow it looks great! Will have to go try it :) thanks for sharing!